"What kind of example is Irish society setting its young people if it cannot do without alcohol being on sale for one day." What kind of example is Irish society setting its young people if it cannot do without alcohol being on sale for one day, the Bishop of Waterford & Lismore has questioned, as he defended the Good Friday alcohol ban. In a letter to the Irish Independent, Bishop Phonsie Cullinan on Thursday warned that the problems associated with the abuse of alcohol are there for all to see. He said these problems were evident especially in terms of the health impact on the individual, damage to family stability, and public order offences. “If Ireland can at least do without the sale of alcohol on Good Friday, we can show our young people that alcohol does not have to be an integral part of our national character and, as importantly, that we can restrain ourselves for a higher goal at least to some degree,” he wrote. In recent days it has been claimed that the ban on the sale of alcohol on Good Friday is “archaic” and “discriminatory” and causes a loss of income to the pub trade especially during this year when the 2016 celebrations will be particularly intense around Easter. In reply to this, the Bishop said, “we should ask why we have the ban on the sale of alcohol on that day in the first instance”. “Good Friday is one of the most sacred days of the year. It is called ‘good’ because it is the day on which the Saviour was put to death for us and opened for us the way to eternal life. The ban is a mark of respect for the Lord and what He did for us, and helps us to make this sacrifice for Him who sacrificed everything for us,” the leader of the Church in the diocese of Waterford & Lismore said. He acknowledged that some will object and say that this day is therefore only for Catholics and other Christians and only for practicing ones, and that the ban therefore discriminates against those of other religions or none. 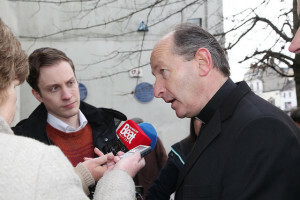 Bishop Cullinan said supporters of a ban on the sale of alcohol in pubs and shops on Good Friday cannot have it both ways. He also asked whether Irish society should be wary of extinguishing, in haste, a unique Irish Christian tradition. He highlighted that on Good Friday, Catholics are asked to share in that sacrifice through the traditional practices of prayer, the veneration of the Cross and through fast and abstinence. The sale of alcohol on Good Friday is an annual public debate, and it is an issue on which Christians can make up their own minds based on an informed conscience. However, the IBDAI spokesman highlighted that each year we can enjoy Christmas Day without pubs being open. “This issue is driven by a hidden reality, the objective of which is about bolstering the financial bottom line rather than serving the common good,” he said.